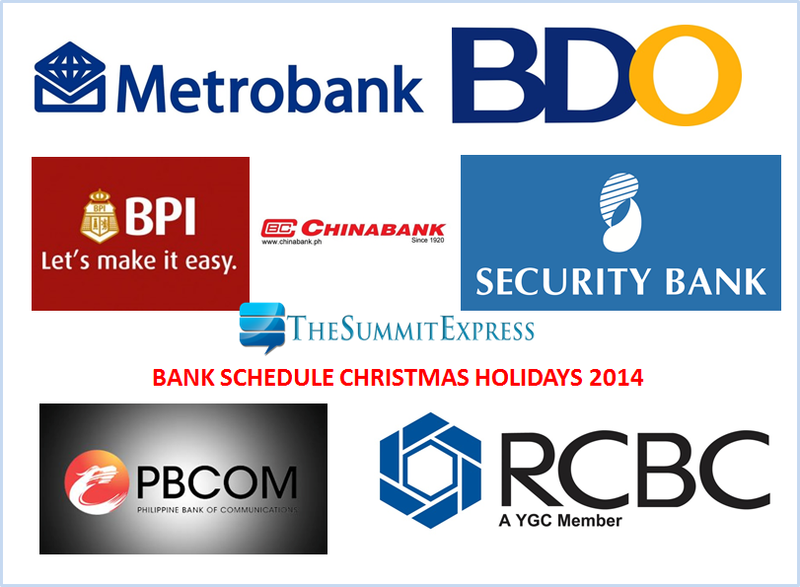 MANILA, Philippines - Major banks in the country announced recently the banking hours schedule for Christmas holidays this 2014 and operations for New Year (first week of January 2015). The public is being reminded that there will be only one regular banking day from December 24 until January 4. 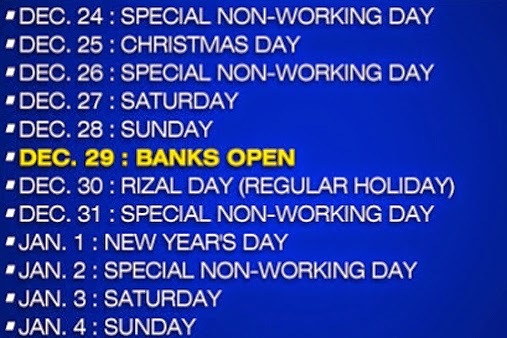 In that period, banks will only be open on December 29 as all other dates either fall on a weekend or are considered holidays. BDO advised that ATM network will be able to handle transactions of clients during this period. On its Facebook page, PNB said that they are OPEN on December 24 to 31, 2014 and January 1 to 4, 2015. Post by Philippine National Bank. On its Twitter post, BPI announced that selected BPI and BPI Family Savings Bank branches will be open on December 24 (half day) & the whole day of December 30 and January 3, 2015. Mall branches and kiosks with Saturday and/or Sunday operations will also be open during the holiday weekends. Transactions that may be processed on these days are deposits, withdrawals, bills payments, buying and selling for foreign exchange, purchase of MC's, and account openings. Remittances from abroad will undergo same-day processing as usual, except on December 25 and January 1. BPI and BPI Family clients may also transact using the banks' ATM, internet, mobile and phone banking channels (89-100) during the holidays. While these electronic banking channels and selected branches are available to clients, we encourage the public to complete all banking transactions ahead of the holidays to avoid the Christmas rush. RCBC and RCBC Savings Bank said they are open on December 24, 26, 30, 31, and January 2. View the complete banking schedule here. Some Chinabank branches are open during holidays for December 24, 26, 30 and 31 and January 2, 2015. For the list of branches open this holiday season, visit here. Security Bank said a few of its branches will open during the long Christmas break. In an advisory, Security Bank said some branches will be open on December 27 and January 3, even if these are Saturdays. View the list of branches and banking hours here. Philippine Bank of Communications (PBCOM) said all of its branches will have extended banking hours on December 23 and 29, 2014. The bank said all branches will be open from 9:00 am to 5:30 pm on Tuesday, December 23, 2014 and Monday, December 29, 2014. All PBCOM branches will be closed during the following declared holidays: December 24, 25, 26, 30 & 31, 2014 and January 1 & 2, 2015. Select Metrobank branches across the country will be open on weekends (December 27,28; January 3, 4) and during the holidays (December 24, 26,30 31; January 2) to accommodate over-the-counter transactions. To view the complete list of open branches on the said dates, you may call Metrobank customer care hotline at 8700-700 or you may check the list here. Please Like Us on Facebook or Follow Us on Twitter for more updates.